If you are searching for promotional products that you can gift to kids on their first day of school, custom pencil sharpeners are the best bet. After all, every kid uses a pencil and they need a pencil sharpener, too. You can give away these customized pencil sharpeners individually or combine them with personalized pencil cases to make a complete school kit. 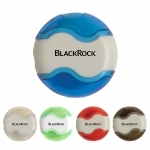 Whatever be the reason to give, these sharpeners are smart to market your brand. You can save on online design proof, artwork assistance and efforts to stand in the niche. Available at the lowest prices, you can enhance your savings by ordering in bulk from us. Avail benefits of fast shipping and fast production time that no other competitor offers. In this era of e-lessons, you will find tablets, computers and electronic devices in most school bags. But you will still find old-fashioned pencils and accessories, too. This makes customized sharpeners an eligible marketing tool. Not only students but their career-oriented parents will also love this gift because they can also use it to keep their pencils in shape. Every time they use this sharpener to sharpen their pencils, your brand logo will get noticed. Logo pencils are one of the most popular promotional giveaways for kids. Have you ever thought what use will be such pencils without sharpeners? 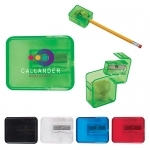 By giving these sharpeners to kids, you can keep your logo printed pencils and your campaign in tip-top shape. 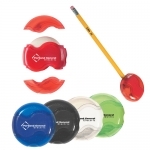 In the promotional products industry, pencil sharpeners are the low-cost promotional items with a purpose. When compared to other printable items, pencil sharpeners can be customized for extremely low prices as little as a few cents. 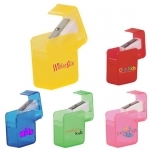 Custom pencil sharpeners are perfect to promote almost any kind of business, right from schools to stationery supply stores to art and craft studio. Imprinted sharpeners are not only popular with school and university students but also used by women in their makeup bags to sharpen their cosmetic items such as eyeliner pencils, etc. If you need an assistance to select the best pencil sharpeners for your business, our talented staff of promotional consultants will help you. You can call us at our toll-free number -855-454-3786 or email us at info@promo4kids.com and our talented staff will help you to select the right product for your next campaign. 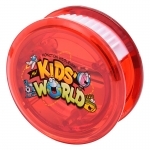 Also, our team of graphic experts will ensure that your brand logo looks perfect on these promotional sharpeners or any other promotional giveaways for kids that you have chosen at Promo4kids.com. Best of all, you will be receiving customized pencil sharpeners at the earliest and at absolutely lower prices than the rest. Thanks to Promo4kids.com's lowest price guarantee and 100% customer satisfaction guarantee.